More pages from my sketchbook. He was a master of Persian Miniature Painting. First time poster - I LOVELOVELOVE that cow!!! 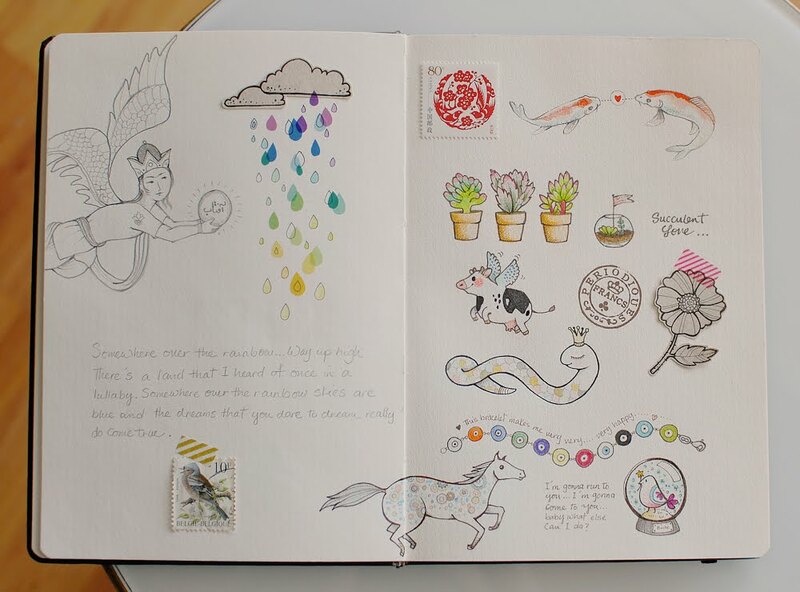 I've been following your blog and love your sketchbook. They are always so beautiful! May I ask what kind of sketchbook you are using here? I like the toothieness of the paper from this sketchbook. I have Moleskines but the paper doesn't take colored pencil well. Thank you for your time. Have a nice weekend. 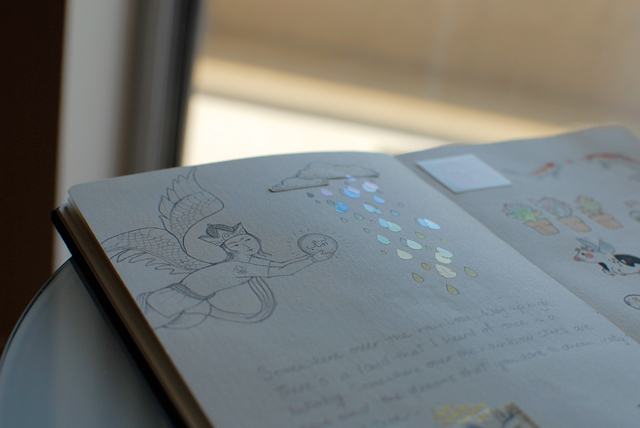 I love every detail in your sketchbook! Those three flower pots and the angels(both , piggy and the girl :D )are so lovely.. Your sketchbook is a precious one! Your sketchbook feels like magic! This literally took my breath away! You have such a beautiful, detailed art style. This is absolutely amazing. i keep coming to your blog, it's soooo inspiring. Totally love what you do. My absolute congratulations for the lovely way you have to put in images and objects such amount of tenderness. Every single sketch is so beautifully and precisely drawn - I like them all! It was so interesting to learn about your great grandfather and to see his beautiful portraits! I'm sure you are proud to belong to such an artistic family! Your ancestors would have been proud with you, too! :) We have a saying in Bulgaria : "The pear doesn't fall far from its roots"! So you are the proof, Afi! :) Be happy and have a lovely week! 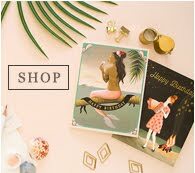 your site is magic ,beautiful ! congratulation ! 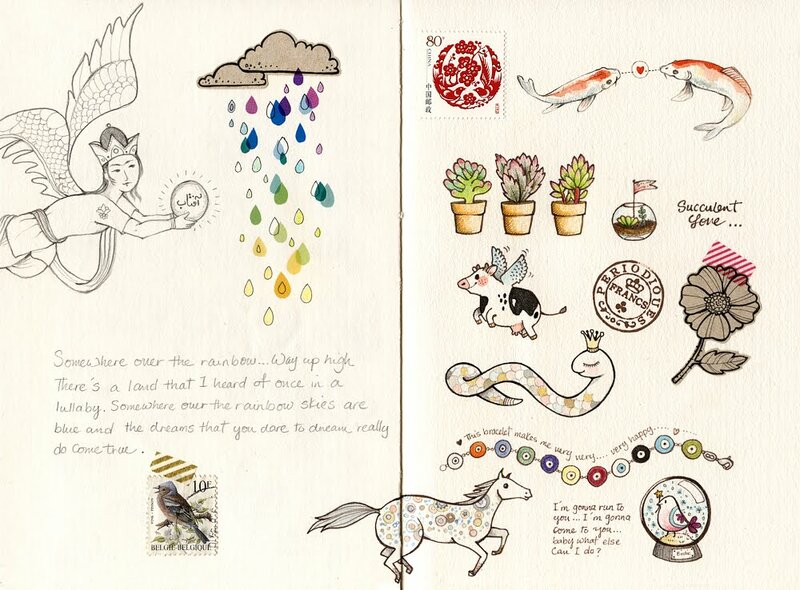 Joo Joo, I'm always excited when I see that you're sharing one of your fabulous sketchbook pages. I look at them over and over, and seem to see something new each time. And your photos/scans are so beautifully done. Thank you for sharing the information about your grandfather; I was fascinated by the information on Persian miniature painting. Clearly, you have been gifted with the same talent!! Another amazing sketch page! so lovely!! I love the stamp you used! which is the name of it? It was great to hear about your grandfather, really interested! you should be really proud! Agus: Thank you dear Agus! :) I don't know the name of stamp, it's from China, I bought it from Ebay. I love this sketchbook. I have always wanted to keep one, but I found that I have more ideas than drawings in my head so now I keep an Idea Notebook instead. But I love looking at pretty things. Your sketchbook is amazing. 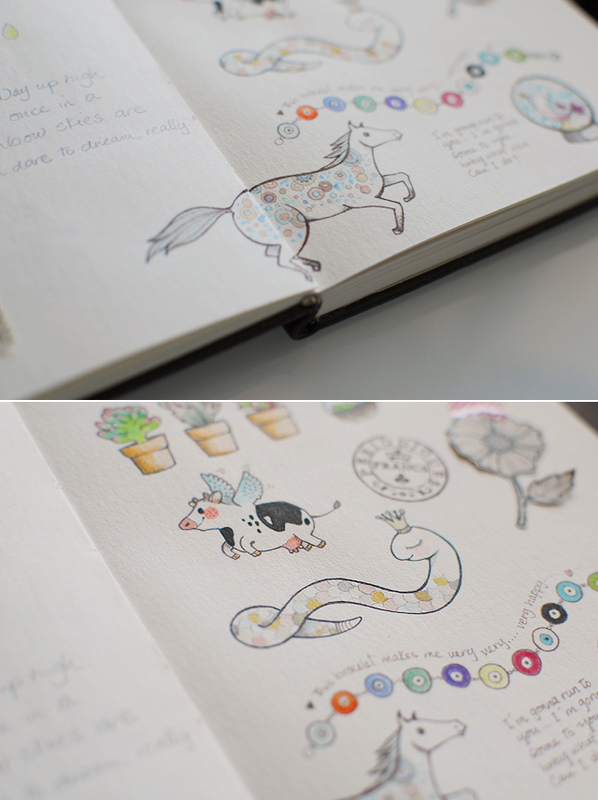 I've just find your blog and really love your sketchbook. It's beautiful and I'll following it. Just discovered your blog, and I am in love with your work! You are so talented! Love, love, love it! you should post your early art when you were learning your art style and getting better! That would be very interesting!